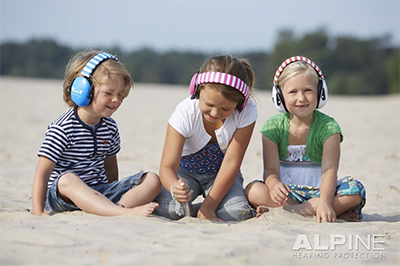 Alpine Muffy Ear Muffs for children meet all of our rigorous standards for a high quality child ear muff. These are folding headband style ear muffs. 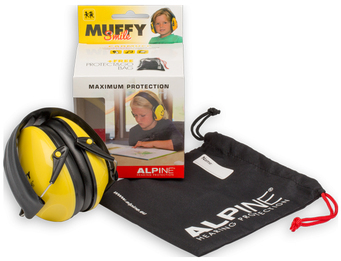 Alpine Muffy delivers good noise protection (SNR 25), a safe design tailored for smaller ears, and superb safety and comfort -- in a super cute, cheerful smiley face design. With ear muffs to protect them from whispering classmates, buzzers, bells, and PA announcements, kids can learn and perform better in school. For children with noise sensitivity or trouble focusing, Alpine Muffy earmuffs can make the whole world a lot less stressful. Ideal for study, test-taking, and general noise protection. Learn more about ANS. Unlike some other "kids" earmuffs out there, the ear cups on Muffy earmuffs are actually a smaller size designed for children's ears. This makes it easy for Muffy ear muffs to establish a good seal against noise, touching the head all the way around the ear for proper child hearing protection. Alpine Muffy ear muffs easily fold up for simple storage and quick transportation. Yellow smiley-face ear cups with solid black headband. Adjustable to fit babies through teens. Want these same great earmuffs in other colors? They are available here.